Today, I’d like to talk about the new immigration policy about unlawful presence for international students. 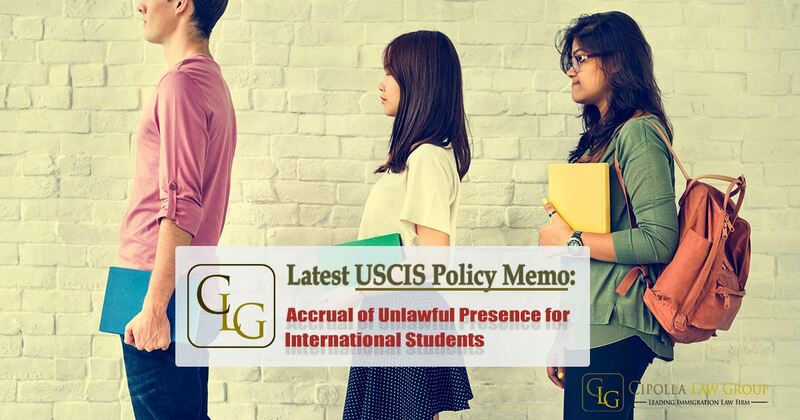 It is one of the latest USCIS policy memos that affects a lot of international students. That policy is that as of August 9, 2018, F-1 students who are not maintaining their student status will now be going to accrue a thing called “unlawful presence”. So what is “Unlawful Presence” and why is it important to international students? How international students can accrue “unlawful presence”? In general, students don’t deem to accrue “unlawful presence” unless the USCIS or an immigration judge deemed that person is out of status. So this isn’t in comparison to someone who say comes on a tourist visa, is supposed to depart the U.S. on January 1, stays until January 10 of the following year and after January 1st, they start to accrue unlawful presence. So if you get 6 months of more unlawful presence, depart the United States, leaves the U.S. you’ll trigger a thing called a “3-year bar” meaning you can’t come back to the U.S. within 3 years or you’ll have to get a waiver or granted forgiveness or a pardon…different culture has different meanings for it but in the U.S. we called it a waiver. If you get a year of more of unlawful presence, departs the U.S. and wants to come back, they’ll be triggering the 10 year bar, so you can’t come back within 10 years unless you get a waiver. How to accrue “unlawful presence” for F-1 students? Students didn’t fall into that category. For instance, a student who just stops studying or fell out of status for some reason, they wouldn’t accrue that “unlawful presence” unless an immigration judge or the USCIS deemed that person out of status which is not the norm. However, beginning August 9, 2018, F-1 students can now accrue “unlawful presence” as soon as they fell out of status. So what does that mean? So say a student just abruptly stops studying, doesn’t communicate with his/her international student department, can’t find a way to keep his/her status. When they stop studying, they are going to accrue “unlawful presence” and if they ever leave the U.S. they won’t be allowed to enter the U.S. unless they have a waiver. Significant of “unlawful presence” – Bar from returning to the U.S. When they departs the U.S. they will be subject to the 3 or 10 years bar, meaning they cannot come back to the U.S. for a long time. Sometimes, there are ways around that unlawful presence but it just makes your situation more complicated. So, if you are a student and you think you might fall out of status, you should get in close communication with your DSO in your international department, seek help from an experienced immigration lawyer, get your preventive medicine before this happens because once it happens the damage may be done.